Orbital Test Vehicle 1 (OTV-1) returned to Earth on Friday at Vandenberg Air Force Base completing the mission it began in April. The U.S.A.F. 's secret X-37B unmanned spaceplane was launched by an Atlas 5 rocket from Cape Canaveral, Florida, on April 22. The U.S.A.F. has declined to admit it carried anything in its cargo bay, but was insistent that the inaugural mission was simply to test craft itself. "We are very pleased that the program completed all the on-orbit objectives for the first mission," Lt. Col. Troy Giese, program manager said in a statement. Only a general description of the mission: guidance testing, navigation, control, thermals and auto operation in orbit, re-entry and landing have made public. The true purpose of the X-37B and more specific details about the spacecraft have long remained a mystery, though experts speculate it was intended to speed up development of combat-support systems and weapons systems. It was interesting to note that U.N.E.T.I.D.A. 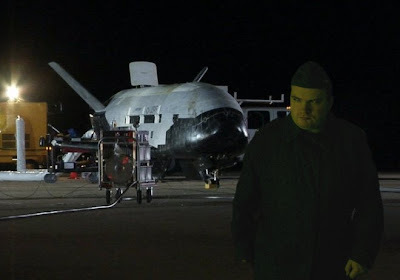 officer Colonel "Whopper" Creedon arrived at Vandenberg as OTV-1 landed. He was observed removing a "portable-herd-drive-sized" object from the craft and left with a small convoy of black Humvees. 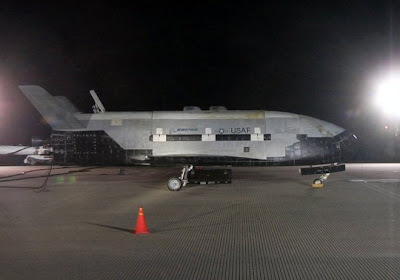 The X-37B will return to space in 2011 next year. I was going to type this yesterday but for some reason the page froze....hmmmmm? I have one question...8 months...8 months for a test flight?, Really? Wouldn't a week been long enough? Hell even a month I'd accept but eight months ...Colonel , it's not the obvious Uniteda cover up I'm dissapointed by but by the fact that with your cover stories , you're really not trying anymore!